Iggy Fenech chats to violin-maker Claudio Chiariotti to find out more about a new and exciting course being offered by the Malta Society of Arts. Since it was established in 1852, the Malta Society of Arts (MSA) has played three very important roles in the local arts and crafts scene: the first was to hone the skills of artists and to give them a space to exhibit in; the second was to keep a record of the changing landscape of local art; the third was to promote and protect manual trades and crafts by giving people of all ages the chance to learn their secrets. Every year, in fact, hundreds of people sign up to one of the dozens of courses held at Palazzo de La Salle on Republic Street – the seat of the MSA – which range from tailoring to figure drawing, and filigree to piano. Yet, a new course that started recently is among the more unusual and important it’s ever had. 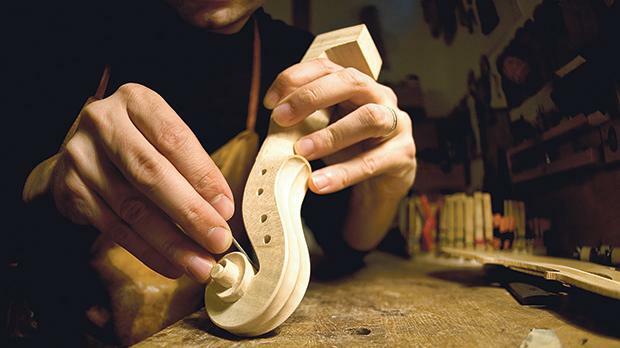 “Through the violin handle-making course, students will be fashioning a violin handle out of a piece of wood. This gives them the opportunity to look at the manufacturing side of creating a violin, which is a great way of entering the world of one of the world’s best-loved instruments,” says Claudio, who has been creating hand-made violins for the past 14 years. “The handle – or neck, as we normally refer to it – is the part where violin-makers are allowed to express themselves, but this has to be done within the rules. The neck, in fact, is the foundation of the violin and one must keep the violin’s proportional harmony in mind to create a neck that will not alter the shape, structure or sound of the final product,” he continues. With an expert normally dedicating some 350 hours to creating one whole violin – 20 to 27 of which are spent exclusively on the neck – the 60-hour course at the MSA is meant to be an introduction to this age-old art. Yet, Claudio’s students will not only get hands-on with the creation of the neck, but also go through the theoretical practices of creating the whole instrument, as well as the famous and unique varnish formulas that finish off these instruments. With so few people in Malta who can craft violins from scratch, this course aims to raise awareness on the work that goes into the building of these instruments and to, hopefully, inspire some to take it on as a passion or profession. Because, indeed, it was a similar course in Italy that led Claudio to join the Bottega di Parma for a two-year intensive study under the mentorship of master violin maker Desiderio Quercetani. And that is why Claudio, along with the MSA, have decided to make this course available to everyone regardless of their skills. Indeed, although Claudio mentions ‘patience’ (“It’s very delicate work,” he tells me) and ‘feeling comfortable working with their hands’ (“It’s a bit like creating a sculpture out of wood.”) as two things that will help participants, the beginners’ course starts from the very basics. “It’s a course that will help violinists gain a better affinity to their instrument, or one that will give sculptors the chance to use their talent for a completely different purpose. Yet, it’s also a course that can give anyone the chance to acquire a skill so few people in Malta have. Above all, however, it’s a fun experience that will completely change the way you look at string instruments,” Claudio concludes.